• Wondering what to do with your life? • Wanting to adapt and succeed in changing times? • Needing knowledge and strategies to understand and control your personal and professional life? • Wanting information and strategies to help others? • Desiring to become what you were born to be? • Wanting courage to change? So What Will Questers Dare To Change Give You? • Proven strategies for keeping your options open and staying focused on available opportunities. • Smart tactics for dealing with challenges and risk when you need to. • Key decision-making strategies to help you turn crises into opportunities, and take charge your own life. • Informative guidelines to help you grow and change throughout life. • Reliable self-assessment tools that enable you to discover who you are, your Quester strengths, are, and what you should do to achieve continuing personal and professional growth satisfaction. Winner of the American Association for Career Education Book Award for Excellence and Innovation, this groundbreaking best seller shows how to empower yourself to achieve a meaningful, satisfying, and productive life in a challenging, changing world. 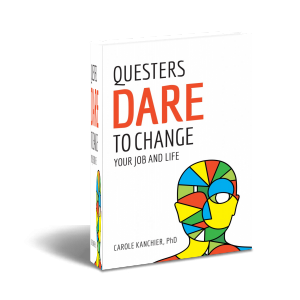 Questers Dare to Change is a must read for individuals experiencing a personal or career transition, considering what to do next, desiring to become what they were born to be, or seeking skills to adapt and succeed in changing times. It’s an excellent resource for the general public, educators, psychologists and business/human resources professionals. What makes a person a Quester? Read about the qualities Questers have in common—qualities you can develop to adapt and succeed. Chapter 4 Career Change: What’s Right for You?